Neck and spinal problems including: prolapsed discs, degeneration, pain, stiffness and weakness. Rheumatological conditions including: Osteoarthritis, Osteoporosis, Rheumatoid Arthritis and other systemic illnesses including Ankylosing Spondylitis. Muscle and ligament injuries including: Tennis and Golfer’s Elbow, tendonitis and RSI. Sports Injuries including: ankle and knee injuries, muscle imbalance, strains and sprains. Temporomandibular joint (TMJ/Jaw) problems including: clicking, locking, earache and headaches. Orthopaedic problems: pre and post operatively. We have dedicated staff who are members of the Association of Chartered Physiotherapists in Occupational Health and Ergonomics (ACPOHE) they are able to provide: Workplace assessments, Return to work programmes, Manual Handling assessment and training. DSE/ Ergonomic Workstation assessments and are RoSPA qualified Manual Handling Trainers who can offer in-house manual handling training to most industries. 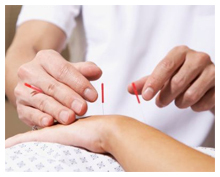 Acupuncture as a pain relieving adjunct to treatment. Functional restoration and back care advice. Home visiting service for those patients who cannot make it into the clinic.